Gary and I were offered the opportunity of a lifetime a couple of days ago, and with the permission of the Primary Participant, we are sharing it with you. Warren Wilkinson, MSR coach extraordinaire (among other accolades! 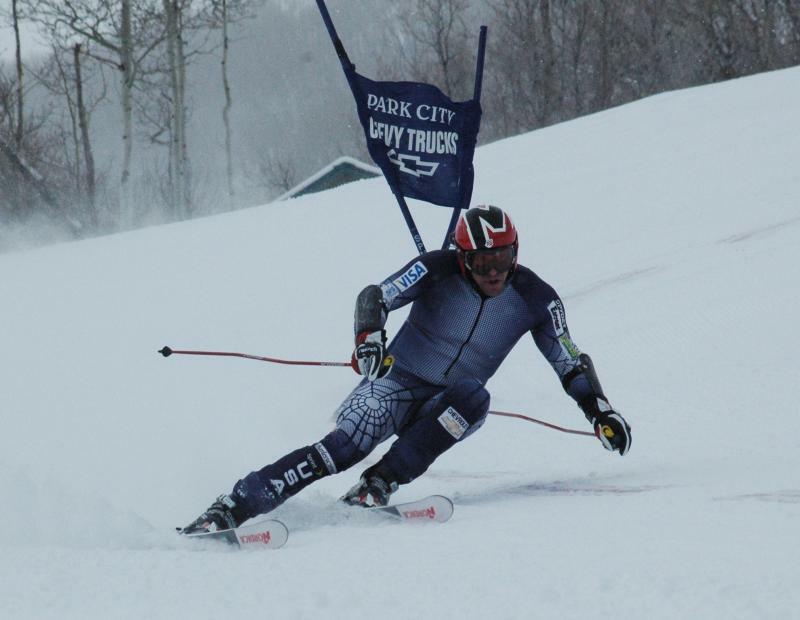 ), called us up a couple of days ago to ask us if we wanted to go out and film/photograph Erik Schlopy while he trained at Park City, in preparation for the 2006 Winter Olympics in Turino, Italy. Despite the fact that we were going to have to be up at 0’dark-thirty, we were all over it. 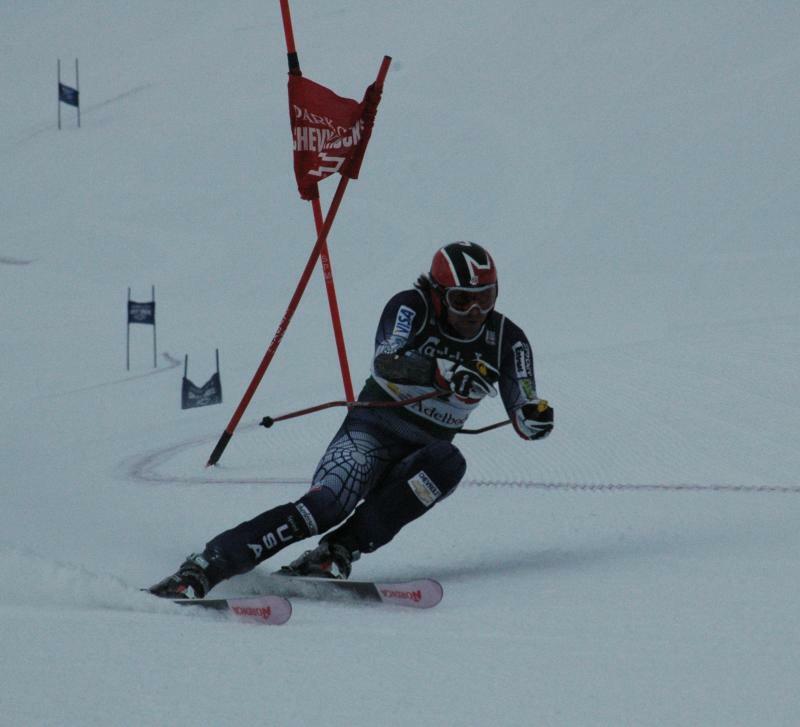 We even pushed up our inevitable purchase of a digital camcorder, so that we could capture the experience (and so we’d be able to study how the World Cup guys ski our home GS hill!). We got there a few minutes before 8. (Never underestimate the effect of snow on the Dranow Driveway. Really.) Only to find Erik Schlopy pulling in right next to us. Obviously we weren’t that late! And, when we got our stuff on (Gary was going up on the lift, and had to put his ski boots on, while I was merely hiking up the hill, and got to keep on my extremely toasty warm winter boots) and got to the lift, we were met by everyone else, standing in the snow, as the lifties shoveled out the lift lines, and the ski patrol were dropping bombs above CB’s. 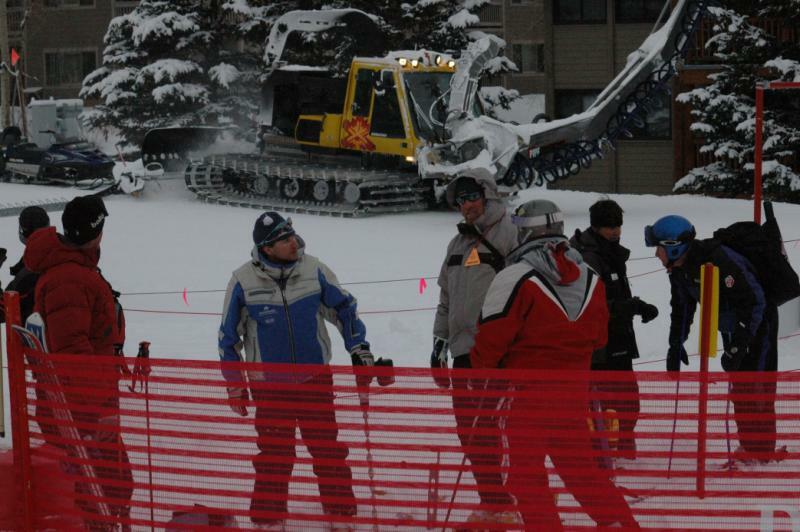 From left to right: Bill Dark, Jeff Sadis, Gary Dranow, Warren Wilkinson, our favorite lift attendant Robin, and Gary Loritz. This is on the ridge just above Picabos, right before these bombs exploded. If the resolution was better, you could see the fracture line from bombs dropped minutes before. As 8:30 rolled around, and no one had been allowed up on the lift to even set gates (ski patrol had their hands full – there is a lot of ridge line above CB’s), it was apparent that the scheduled pre-public runs on the flats above CBs (from the homolgated World Cup start) were out of the question. Still, it was shortly after that that everyone on skis got on the lift, and began the task of setting gates, while I hiked up to find the optimal photo-shooting location. Starting at the Nor-Am start on CB’s, the course was set pretty quickly, and Erik was out for a cruise of the course (not exactly an inspection run, but not a full-speed run, either). As an FYI, Erik was running about 3 seconds slower in his jacket and pants, than he was in his speed suit, according to the timing sheets today. A comment about inspection; Erik knows this hill like the back of his hand. He needs only take a very fast slip or even run it half throttle to check out the set. Needless to say, at the World Cup he would take a completely different approach to inspection. After the ‘inspection’, he came back to get serious. And for those of you who might think that the pictures of him might be ‘airbrushed’, let me assure you, the guy is really built like a superhero. *grin. Anyway. As the still photographer (and far down the hill from the gathering of coaches/race dept. people/dedicated friends), I could stand anywhere I wanted. And so yeah, I thoroughly enjoyed the fact that I could get as close to the course as I wanted (within reason, of course!). In general, I was about 15 yards down from the primary gate I was shooting, and could have gotten closer, if I thought it would have given me a better camera angle. 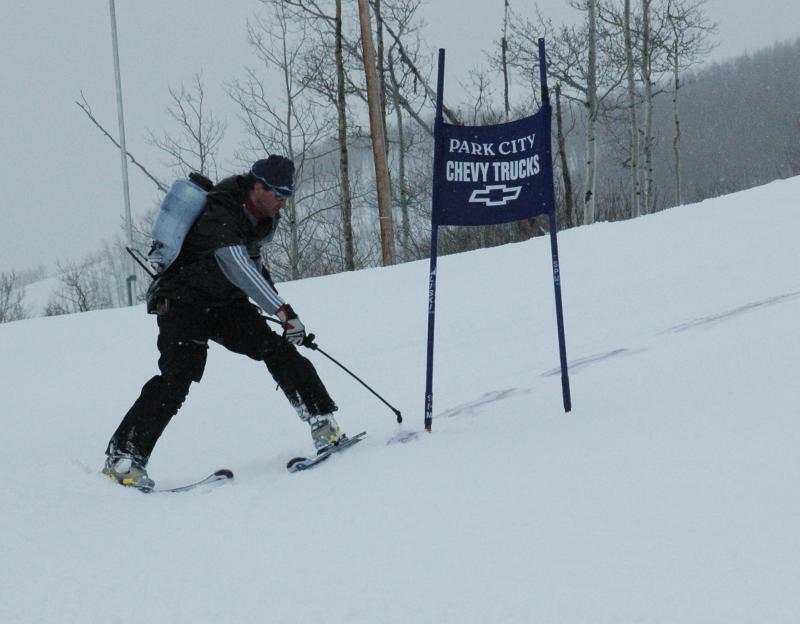 To put this in perspective, when Park City would hold the America’s Opening World Cup race, I was usually sitting in bleachers, Way Away from the hill, or at the finish, usually standing behind someone in a big goofy hat. The view from the Jumbotron was only slightly better. And Erik is the nicest guy in the world; unassuming, very down to earth, and very casual. A real role model for racers of all ages. The guy’s an inspiration on the hill, and if I had children in this one case, the poodles don’t count – sorry, kids!) 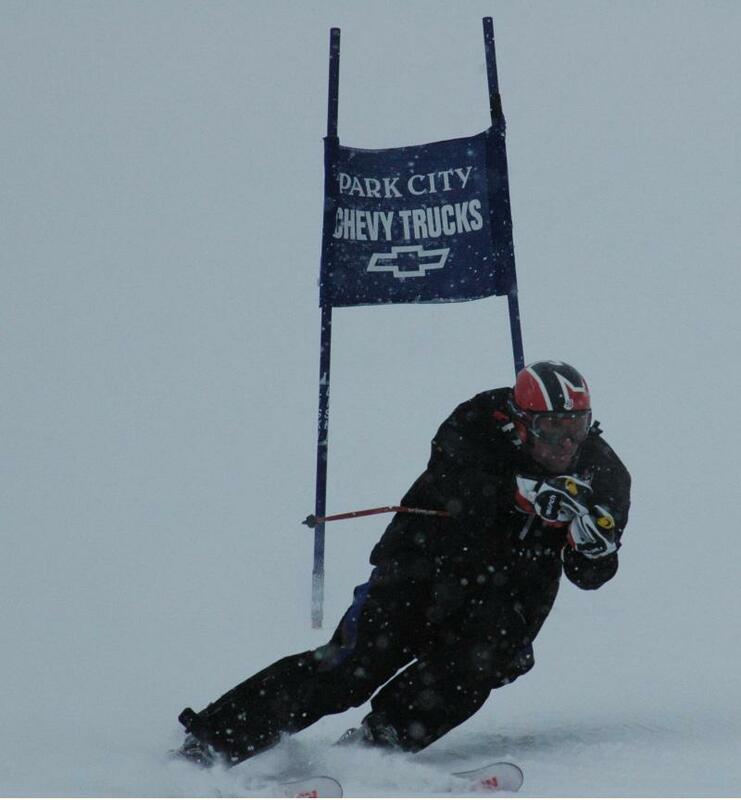 he’d be the person I’d want my kids to look to as a model in ski racing. He is the full package: talent, personality, and approachability. All I can say is Wow. If you EVER get this opportunity, ignore the fact that you have to get out of bed at the crack of dawn, ignore the fact that your feet will be cold and your legs will be stiff. 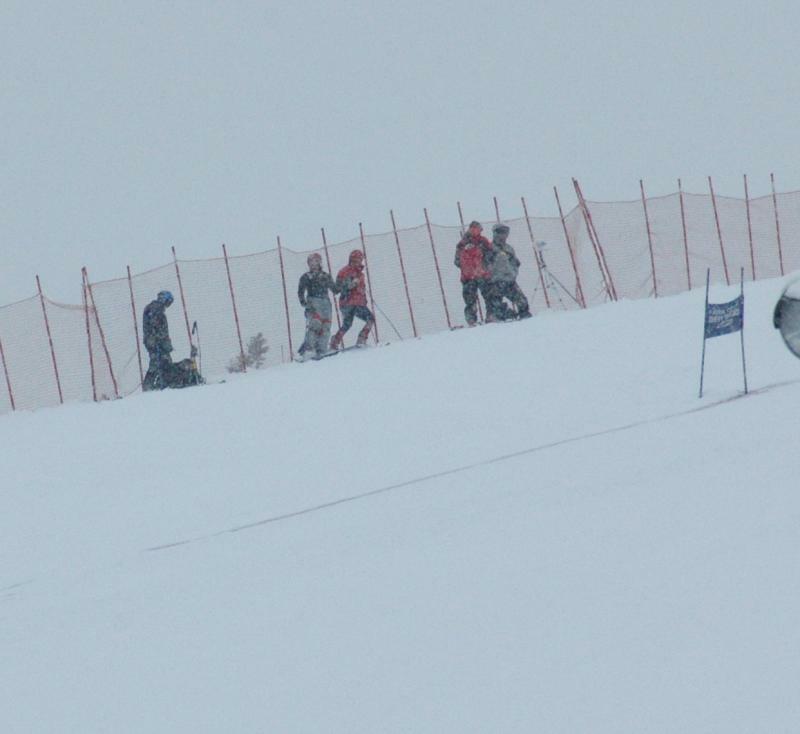 If you are watching behind the safety barriers provided at a ski race, cool. If you are on the hill, feet from the action, even better. We had 6” new snow with grooming somewhere between the layers. The hill was soft. The light was flat. 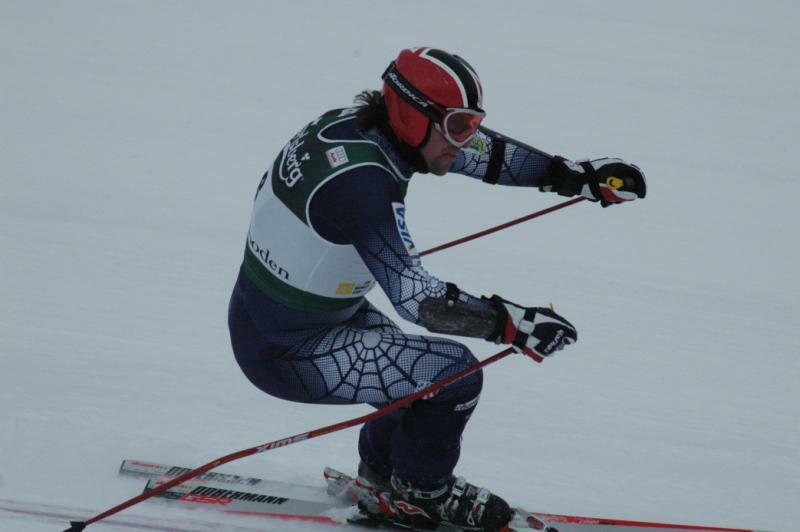 Warren set a course with a goal of getting Erik ready for the probable second set at Sestriere, Colle. If our intel is correct the American Coach will setting run one and much like Wegen it will be a technical turny course. The second course, however, will be set by one of the Euros and Warren believes we will see a wide open down the fall line set as we did on the second run at Wegen. Erik is a master on the technical courses, which is not an issue. 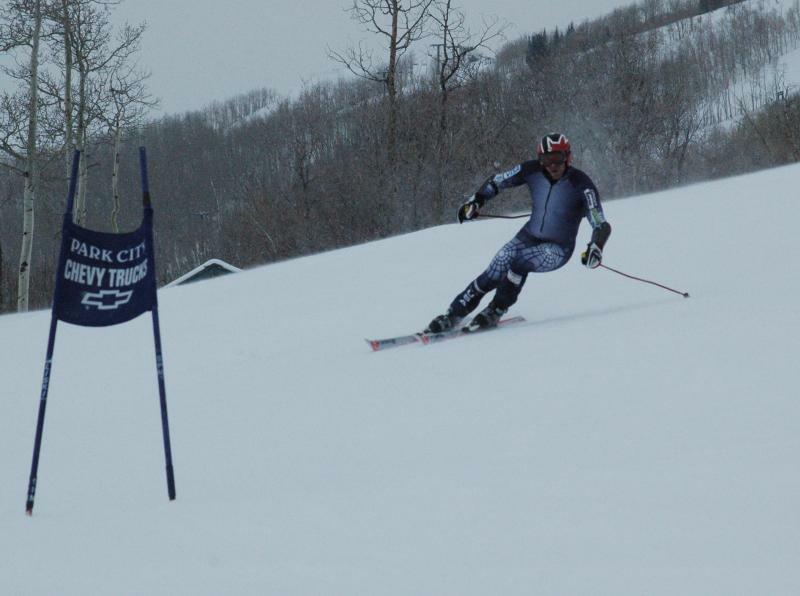 We certainly saw that today as he bombed down CB’s like I ski the NASTAR course at Blanche. So Warren set an open and fast course. The issue was the soft snow, flat light so Erik had Warren tighten up three gates coming off of CB’s face onto the Ghost Flat. We also had the crew get up and lay down dye giving Erik some reference what the true snow level was at the base of each gate (really needed at 50 MPH). As an aside, this is also proof to Jeff Sadis' mother that he has a Real Job, and Does, in fact, Actually Work. Tomorrow we are facing more snow, so conditions will be soft again and probably poor visibility. 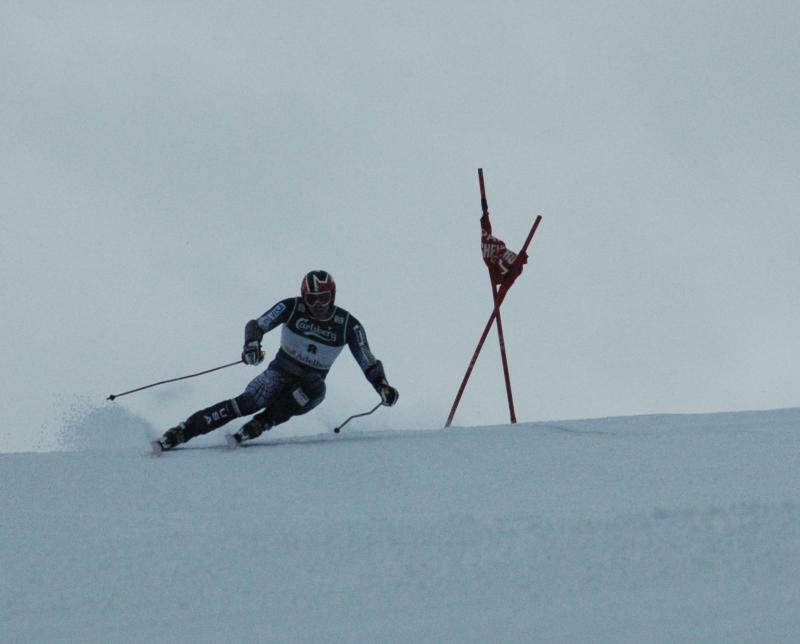 I guess the point is if you can charge down 56-degree slope in those conditions nothing will bother you and as Erik will be facing lots of terrain changes at Sistriere, CB’s presents a good training environment having 5 major terrain changes. 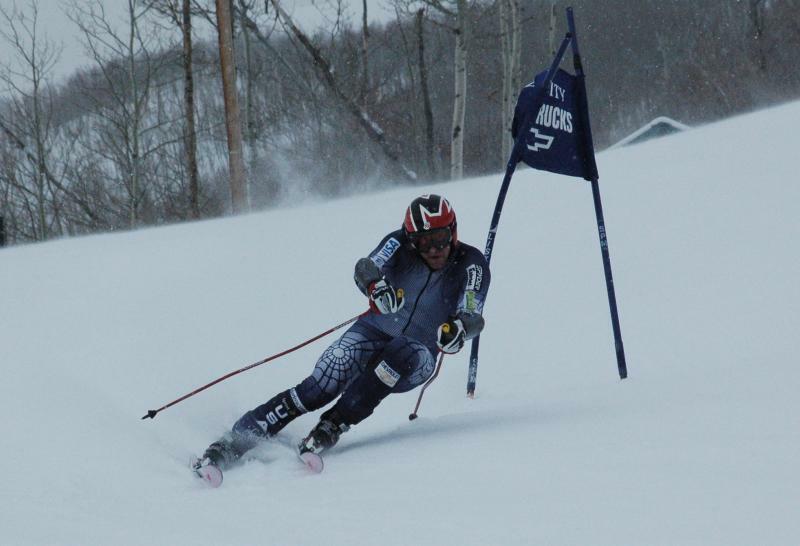 A little bit more information is that Erik is quite familiar with the Olympic venue hill having raced it back in his NorAM days. 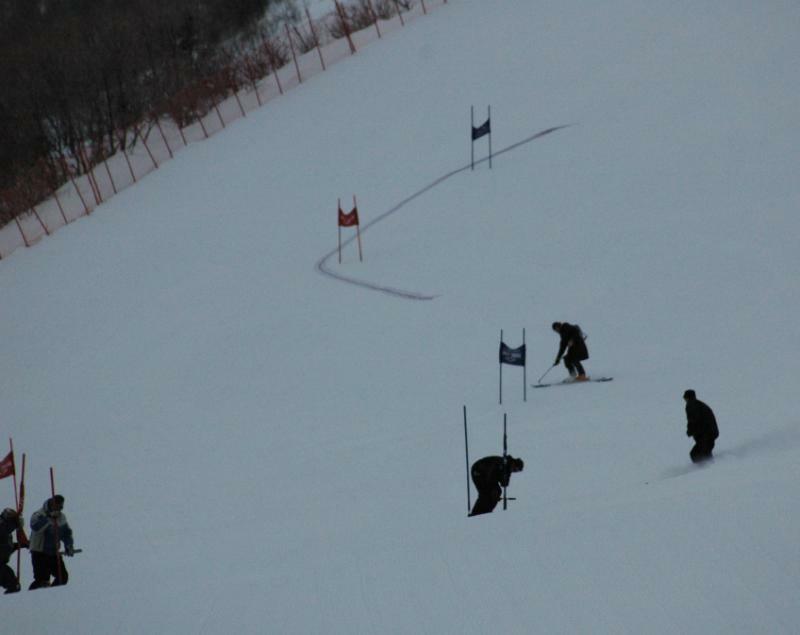 The hill has a flat gliding section, drops into a short steep face, and then has “steps” with fair pitch of 2 or 3 to flat sections of 2 or 3 turns several times down to the finish. Not a frighteningly steep track but tricky enough that if you don’t know the track there is places where the racers may get jacked and airborne kinda of like that break over at Beaver that was throwing guys into the air. We have video of 4 runs, as soon as we get them compressed into a reasonable size they will be available for viewing on our site with Erik’s kind permission. 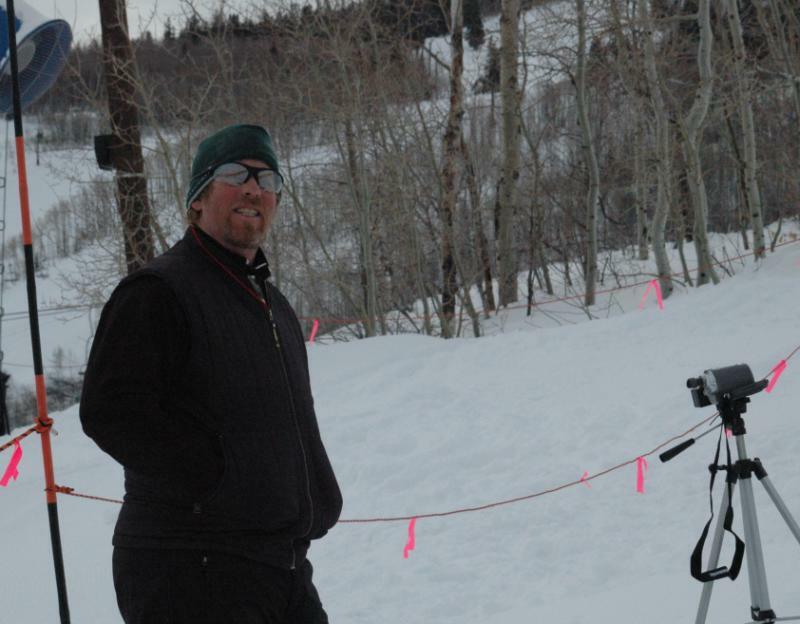 Gary getting the video, surrounded by coaches, race department people, and the University of Utah race team and coaches, who were getting ready to train on the hill as soon as we were done. Lastly, his skis. He was on a pair of 193cm Noridca. What was interesting to me was that they had a textured top sheet kinda of like the Atomic speed ski. 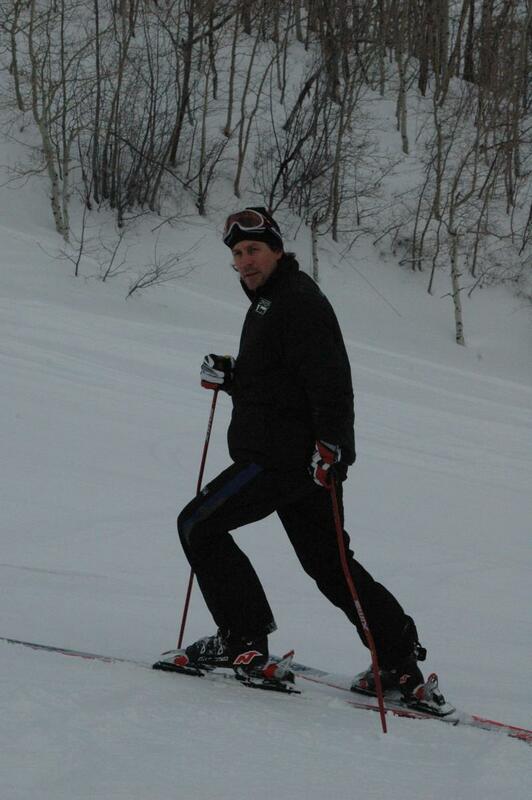 Other than that the ski was a flat sidewall, wood metal laminate with a medium flex pattern. Red and White graphics predominantly. Nice ski. 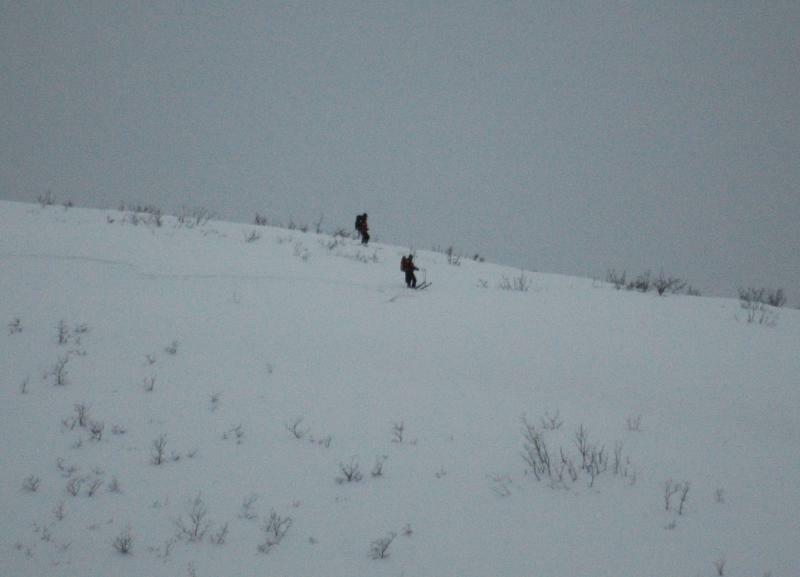 To summarize Day 1 of training: Not optimal training conditions, too soft, poor light. 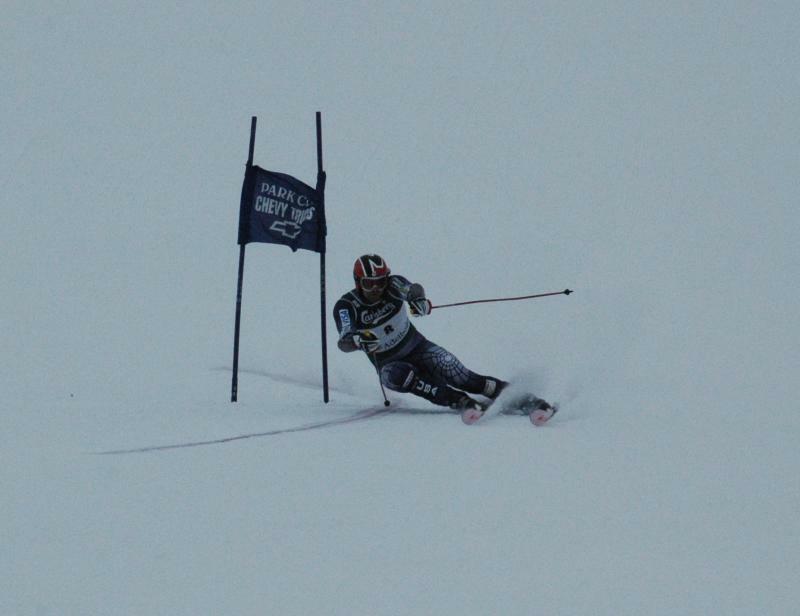 But the crew got the course set, a few slips in and our Olympian skied only DQ’ing one run out of four. 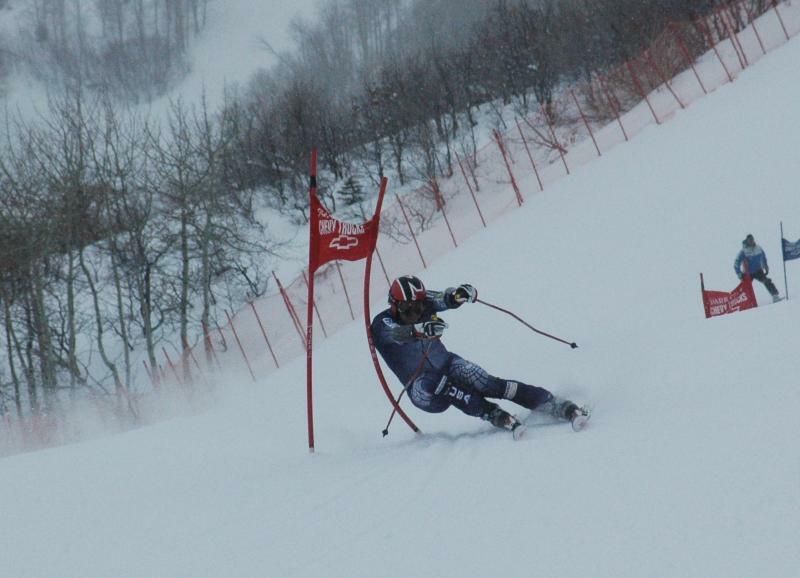 In those conditions, he is skiing solid and looks good - to this old coach - and to be in form at Torino, Sestriere located on the top of Mount Sises. Gary and I took a more laisse-faire approach to the Schlopy race training today, arriving as the guys (not being sexist – it was all men; I see no reason to carry gates when someone else can do it! And no, I don’t change tires, either!) *wink were setting today’s course. We hiked up the hill, and got ourselves set up for another day of hard work. And while I am inherently a bit of a wuss, I think most people would count this as work – at least it puts stress on the body; try stranding on a 35 degree slope, balancing yourself, so you can take steady pictures. Okay, maybe I’m a wuss. But my lower back was shot from yesterday, so it seemed doubly hard today. Work, yes, but well worth it. Again. The course set required us to hike farther up the hill, so that we had a clear view of Gotcha face (a 54 degree pitch). Today’s set was designed to get Erik carrying speed on the face, and then slammed him with turns one he got on the flats – a model of what he will be likely expecting at Sestriere, Colle.. If this set was used for a Masters race on this hill, we’d have bodies everywhere. But Warren is a smart coach, and a smart course setter- he’d never give us amateurs anything like this. But for the best in the world? That’s a different story. And a different story it is. 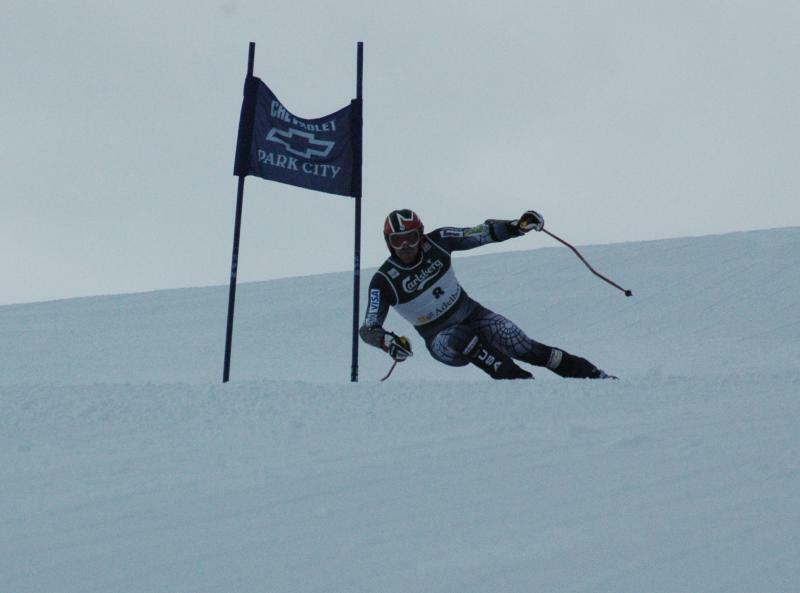 The conditions were favorable today, so Erik was able to start from the World Cup start (thanks to a snowmobile and a race department guy, and before the public got on the hill). 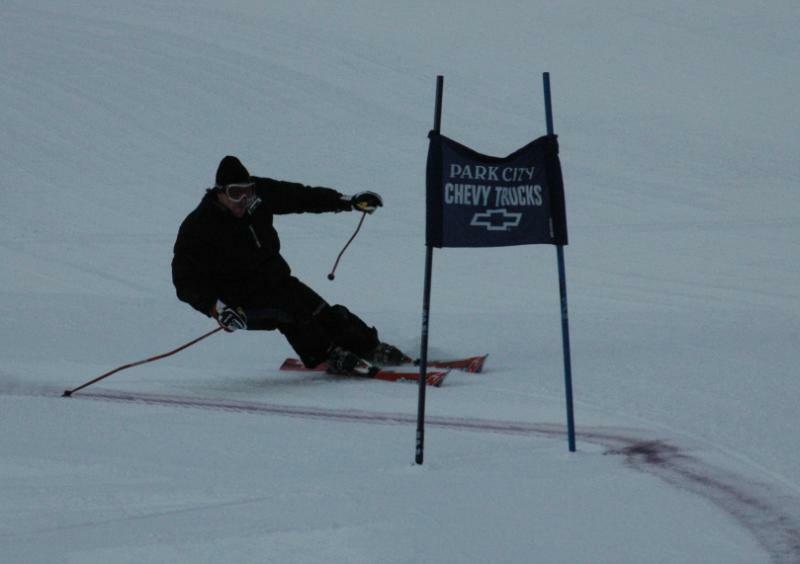 And this guy skis CBs face – the steepest pitch on the run, at 56 degrees – like us mortals ski groomed beginner runs. He charged the entire thing. As my husband so sagely pointed out, yes, this is why he is among the best in the world. Anyway, enough words. Time for the pics. 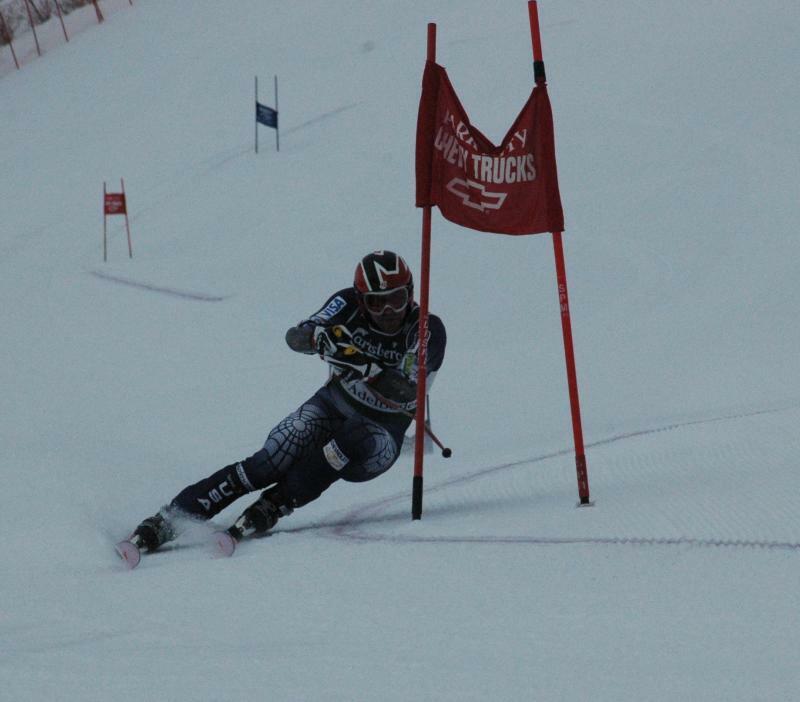 And yeah, I’m having a ball shooting these; it’s pretty easy to get good pictures when you have a great skier! Erik stopped by to thank us for the videos and still pictures (we arrived this morning with a CD of the video/stills – just part of the Dranow service! ), and I took the opportunity to get a casual picture. I also took a picture of the happy videographer! Because us photographers never get photographed enough! 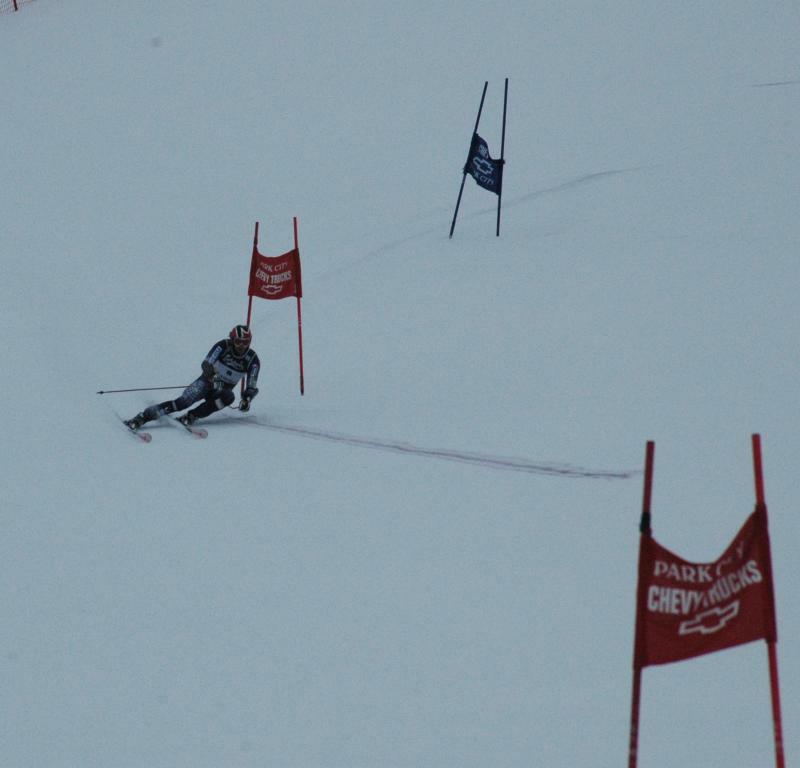 The first run was, again, a suited run. But then, it was time for a suit, and a bib. There was a bit of a scramble for a bib, until they came up with an ‘Adelboden’ bib. I didn’t realize they got to keep them…. If they don’t, well, I’m sure it probably accidentally got packed before it was returned to the race room. My lips are sealed, as are yours, I’m sure! And just to give you an idea of How Close to the course I was, here’s a picture where Schlopy doesn’t even fit in the picture. A racer’s (and photographer’s) dream! After the first run, I hiked a little further up the hill, and was able to get some good shots of the ‘delay’ (yeah, it was a delay, but it really served to get the skis running fast!). The next run was just as pretty. This. Is. Skiing. After that, I moved back down the hill, to catch him on the final pitch. And after all of that, I guess he earned some well-deserved rest. 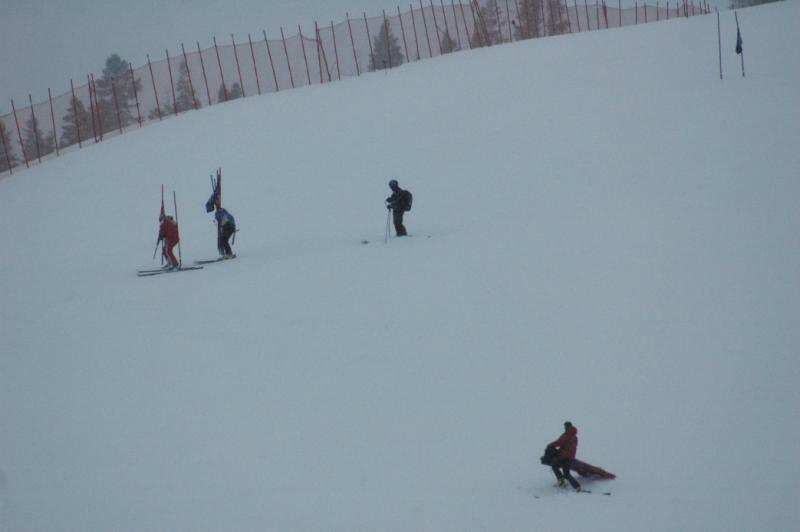 As for specifics on the courses set: there were two different course setters over the three days of training. Warren Wilkinson set for two of the days and Marion, the Women's Team head coach from last year set on the third day. Using the two course setters was to simulate the different approaches to a hill that two WC setters might take. Before the sessions Erik gave feedback to setter on what he wanted, including specifics on what elements he wanted included in the course, in order to help him gain confidence on the types of sets he will probably see in Sestriere. After each run, he had a discussion with Warren about how he was skiing the technical courses well but not finishing as high as he would have liked on the more open sets (sets that emulated some of the Euro setters). For this reason Warren set sections that were VERY FAST and in the fall line but also challenged him with sections set to the "max" in vertical distance and OFF SET, especially coming off of the steeps, an element that is a part of the Sestriere venue, Colle. Each day's set was based on situations he will encounter at Sestriere. They purposely made the technical sections coming off of the steeper pitches more difficult to carry speed across flats. At Sestriere this is a section that if you dump your speed as you hit one critical flat section your day is over. As for feedback on the training runs, all he wanted to know during the actual sessions was whether he looked in balance in the tough sections, and what the clock said. 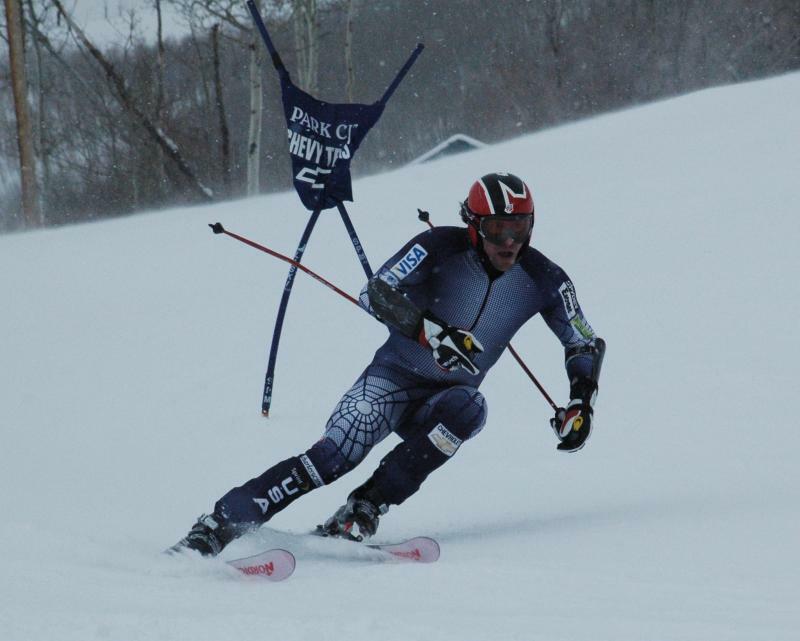 For Erik, it was his decision was to come to his home hill to train for the Olympics, knowing that he could gain confidence in an optimal training environment, including coaches that knew him well, and on a familiar hill. Ultimately, these training sessions were about confidence. 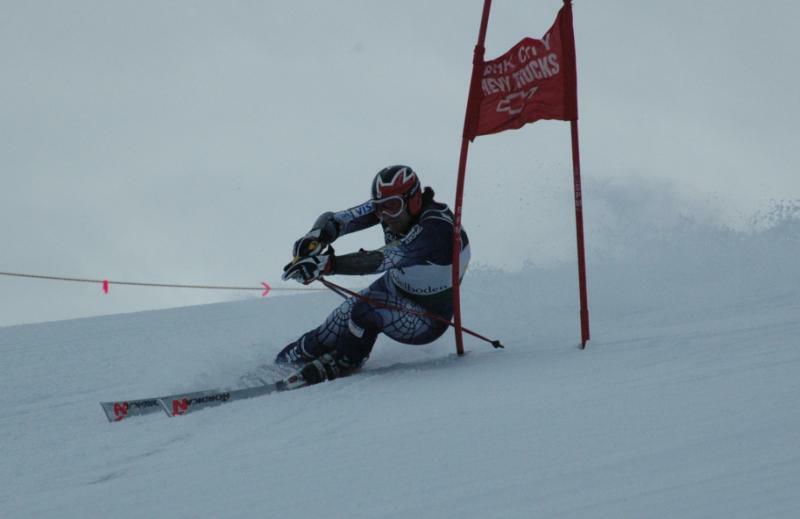 This was not about refinig technique, or focusing on anything other than preparing for specific issues that he anticipates facing on Colle at Sestriere. 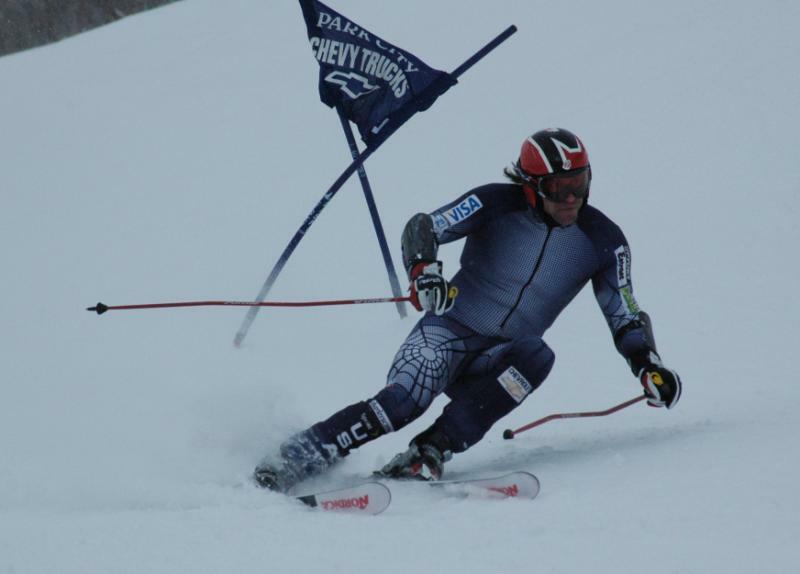 Whether YOU are preparing for the Olympics, as Erik is, the JO’s or even the NASTAR Nationals, by the time you are in last phase of training it is not about technique; it is about confidence, attitude, and simulating situations that you may encounter. Because these training sessions were designed to only reinforce confidence, Erik took only 6 to 8 runs per training session. To simulate the conditions of a full length WC course, physically, he he did 20 seconds of plyometric jumping in the start then goes immediately. Regarding equipment: Sep, Erik’s serviceman, paid by NORDICA was there to take notes on how each set of skis performed on each run. He has a book with a page on every WC hill on the circuit with notes about conditions, terrain, weather, other variables that is very similar to Professional Caddie’s yardage book in Golf. 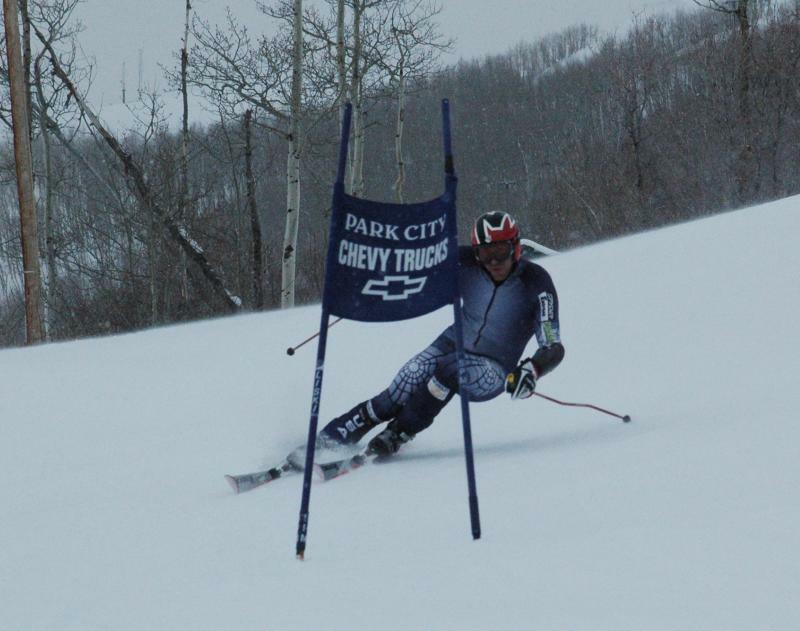 On a final note: starting tomorrow, most of the Men's tech team will be at Park City for a few more days of training before leaving for Torino. Unfortunately team Dranow is busy getting Dr. Liz ready for her first Master Regionals and her first Super G race ever. I will be sitting out and coaching Dr. Liz, and will not be able to get additional coverage of how the WC skiers prepare for the big races. 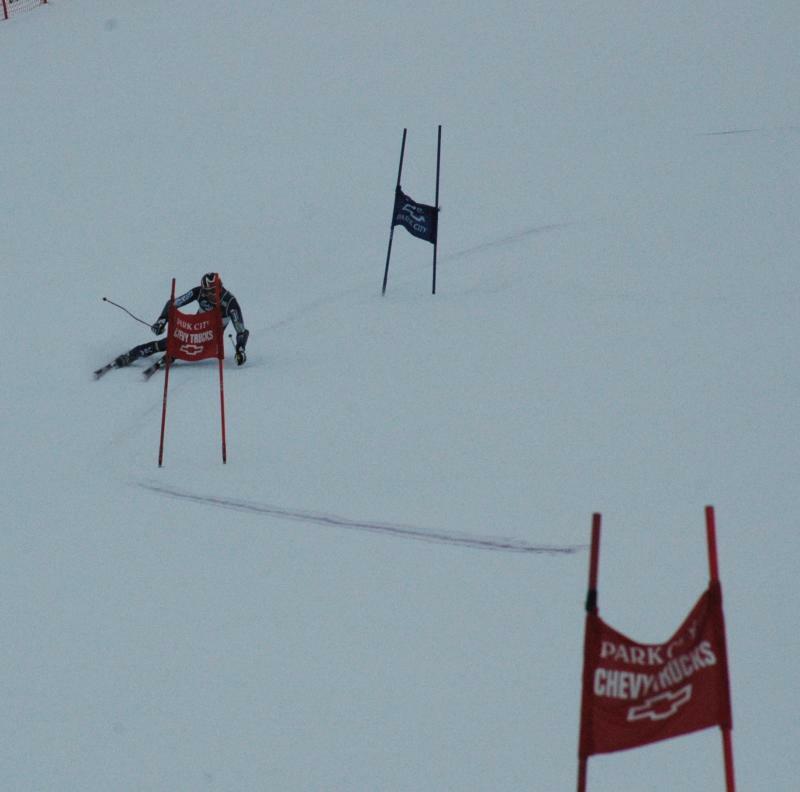 That said, we were very fortunate to get an ‘up-close and personal’ view of how one of the best skiers in the world trains for a Big Race. All images copyright Elizabeth Dranow, 2006. No reproduction without permission. Thanks.